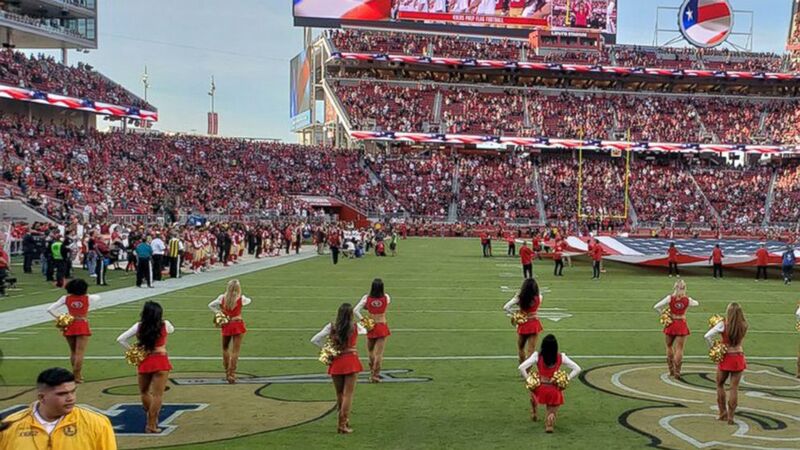 A 49ers cheerleader knelt during the national anthem during the Raiders game. A San Francisco 49ers cheerleader dropped to her knee during the national anthem ahead of Thursday’s matchup against the Oakland Raiders in what appears to be the first public protest by an NFL cheerleader. At this time, it remains unclear which cheerleader knelt while the rest of the squad stood in formation. 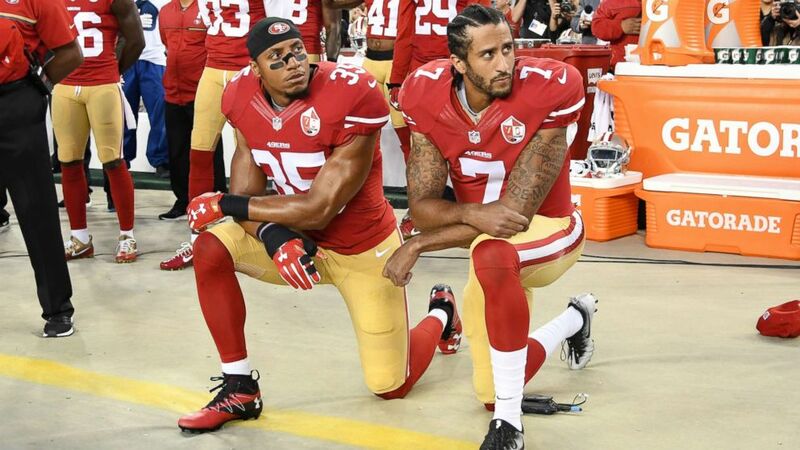 The movement to take a knee started during the 2016 preseason when quarterback Colin Kaepernick -- then playing for the 49ers -- knelt during the anthem to protest social injustices that minorities face, especially by police. He was joined by his teammate Eric Reid, along with others in the league. (Twitter/GatorLenny) A San Francisco 49ers cheerleader is seen kneeling during the national anthem ahead of the team's game against the Oakland Raiders on Nov. 1, 2018. The 30-year-old's controversial demonstration attracted both backlash and praise by spectators, including President Donald Trump, who called for the firing of NFL players who knelt in protest during the anthem. Kaepernick was ultimately marked as the face of the national movement. In 2017, he opted out of his contract, making him a free agent. Kaepernick currently remains unsigned for the 2018 season. In May, NFL Commissioner Roger Goodell introduced a policy that required players to stand during the national anthem, but would allow them to have the option of remaining in the locker room during the pregame performance if they choose to do so. The policy would ultimately fine teams for players who chose to sit or kneel during the anthem. The NFL, however, put the policy on hold for the 2018 season to allow for further discussion between the union and the league about the issue, according to ESPN. Kaepernick's demonstrations continue to draw support from a number of athletes and other personnel in the NFL. (Getty Images, FILE) Colin Kaepernick and Eric Reid of the San Francisco 49ers kneel in protest during the national anthem prior to playing the Los Angeles Rams in their NFL game at Levi's Stadium on Sept. 12, 2016 in Santa Clara, Calif. Earlier this season, Miami Dolphins wide receivers Kenny Stills and Albert Wilson knelt and defensive end Robert Quinn raised a clenched fist while "The Star-Spangled Banner" played before their game against the Tampa Bay Buccaneers. A South Florida police union urged its members to boycott the football teams' games in wake of the incident. During the 2017 season, Meghan Linsey -- a singer who performed the national anthem during the Seattle Seahawks-Tennessee Titans game -- took a knee on the field with no players present after she finished her rendition.